This video is part of the appearance, “NetApp MAX Data Presentation at Tech Field Day Extra at NetApp Insight 2018“. 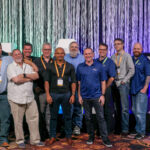 It was recorded as part of Tech Field Day Extra at NetApp Insight 2018 at 11:45-12:45 on October 24, 2018. The pace of IT revolution in the past 5 years has been staggering, with rapid evolution of HDD to flash, to NVMe flash/host attachment. The next wave of flash will consist of persistent memory solutions such as 3D XPoint and NVDIMM that elevate storage to memory speeds for real time applications, but storage is really no longer just storage. New ways of delivering services such as server based (HCI), SAN based and cloud based and the next wave of flash has to participate in them all. NetApp MAX Data is a software defined solution that delivers in memory performance for enterprise applications without trapping you in a single delivery model. MAX Data, the next wave of flash.